There is no better feeling than the blog writing itself. This one came to be as I assembled a recent store order. Stitched sample and diagram done without lifting a finger! Bam! The downside is the stitched sample is black on black. (I lightened it up a bit to help.) The stitched sample is from Debbie Mumm’s Mr. Owl and uses Petite Very Velvet (black lines) and Fyre Werks Soft Sheen (gray lines). Other ideas for this stitch include water with Kreinik Metallic Fine Braid (#8) (black lines) and Petite Silk Lame (gray lines) on 13-mesh. (I love really lightweight threads on 13-mesh. It’s a great way to integrate beautiful painted shading.) Flip the diagram 90° and stitch the beetles in vertical columns for a tall coat or dress with Flair (black lines) and your favorite silk floss (gray lines). I swapped the matte and metallic in the last example because of a cute variation you should absolutely consider. Add a straight stitch three rows wide across the center of the gray lines where the stitches are split. (It would be a horizontal line in the diagram and a vertical line in the clothing example). For the clothing, I would add a single strand metallic such as Kreinik, Entice, Japan Thread, or Petite Silk Lame (as thought starters). You could even add a bugle bead across that intersection! Using this as a stitch for clothing or water are simply thought starters. I would love to see what you do with this stitch! 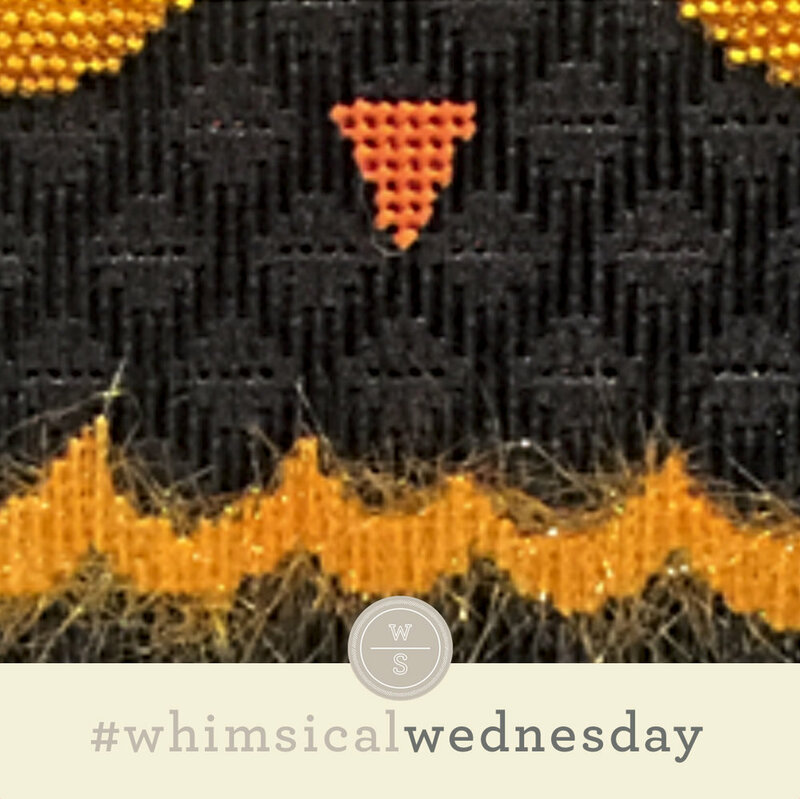 This stitch diagram, along with all other #whimsicalwednesday and #smallspacesunday stitch diagrams, can also be found on a Pinterest board here.